With the announcement that Spider-Man is now going to be rebooted and worked into the Marvel Cinematic Universe, I'd like to talk about where the previous franchise went wrong. Before I get started, I just want to say I loved Amazing Spider-Man 2. I put it in one of my top comic book movies and it was one of the most fun and surreal times I've ever had in a movie theater. Not knowing whether or not they were gonna kill off Gwen Stacy, seeing as how Emma Stone was one of the obvious highlights and draws of the entire franchise, kept me on the edge of my seat for the entire movie. The scene in which she dies was great (hand-web gets a little hammy, but so does "Don't worry, Spider-Man, none of us on this train will ever try to remember your face so we can cash in on it later on"). It was a lot of emotional impact just kind of distilled into one moment, and it genuinely shocked me. I should have seen it coming, but I still thought they wouldn't go through with it, wavering back and forth on it until the very end. It was a surreal moment. It really got me. It engaged me as a viewer and really made me feel the impact. But they shouldn't have killed her. Gwen Stacy's history has been a storied, and tragic, one. In her initial Stan Lee/Steve Ditko appearances, she was forceful, powerful, and even antagonistic. She knew what she wanted and was vengeful when she didn't get it. But a big part of that was just Ditko. In that last stretch of Ditko's run on Amazing Spider-Man, there was an undercurrent of anger, and it was omnipresent throughout the stories. 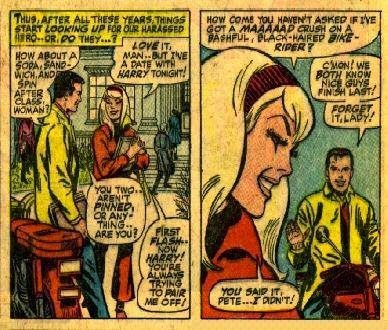 When Ditko left and John Romita took over, Gwen (and Peter, and everyone else) mellowed out a bit, and Gwen and Peter got over their initial antagonism (which was always hiding their mutual attraction). The disparity was such that later retellings, such as in Jeph Loeb and Tim Sale's Spider-Man: Blue, would be more of a mix between the two personalities. Gwen isn't as angry as Ditko made her out to be, but she wasn't the demure perfect girlfriend she'd often be made out to be either. 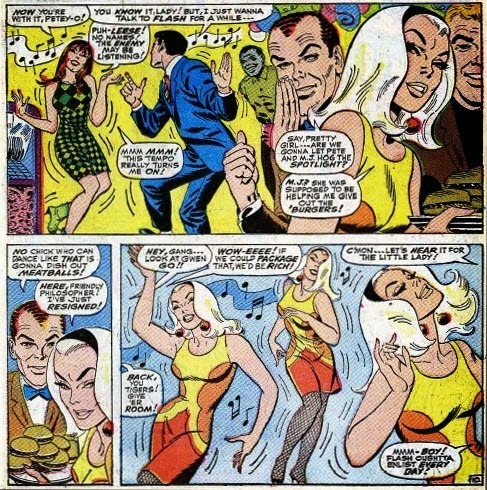 But for most of Gwen's appearances before her death, she did vacillate between being Peter's perfect girlfriend or being the party animal (at times, she would out-party Mary Jane Watson, the party girl). She knew what she wanted, and she was gonna get it. Gwen was a strong enough character that, according to one version of the story, she had nowhere to go as a character but as Peter's wife. 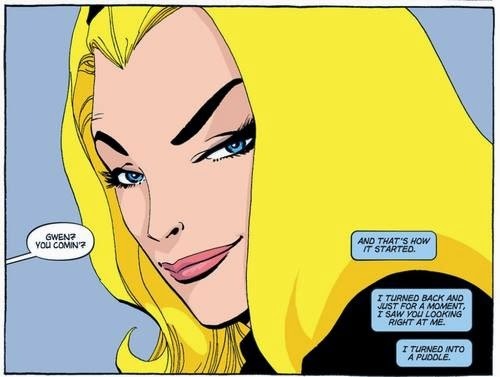 I know that sounds incredibly not-modern, but Gwen is a supporting character and to break them up would have either meant an inorganic friendship (they weren't that type of relationship — unlike Mary Jane and Peter, I can't see them being friends after breaking up) or have her written off altogether. Of course, that is what happened, and Gwen met her final fate in the classic "Death of Gwen Stacy" storyline by Gerry Conway and Gil Kane. It's this moment specifically that Kurt Busiek posits as the end of The Silver Age in his and Alex Ross' seminal work, Marvels, back in 1994. It symbolizes the loss of innocence, the time the stakes were raised. And so Gwen became the symbol of a milestone in the evolution of comics. This death was held as sacred as possibly by comics fans and creators alike, that it was commonly accepted that Gwen, like Bucky, would never be brought back to life. But if that's the case, why did killing off Gwen Stacy in Amazing Spider-Man 2 spark such a negative reaction? The movie itself was badly received on the whole. It's hard to argue that the plot isn't a structural mess, and it's so crammed together. The whole story with Harry Osborn as the Green Goblin could have been saved for the third movie. On top of that, the Rhino, advertised in trailers and posters as being a main villain, doesn't show up until the epilogue, Electro gets too much screen time, and Dr. Kafka exists. Given that, it's easy to just pile Gwen's death on top of that list. There are a few big positives for the movie. It's the closest Spider-Man himself has ever looked to his comic book roots. Nothing else comes close, really; ASM2 was able to capture the acrobatics, the spider-sense, and the sense of whimsy Spider-Man carries with him. Andrew Garfield is a great, even transcendent, Peter Parker. But although Garfield is an excellent Peter, the audience, especially those loyal to Tobey Maguire, isn't fully captivated. What's undeniable, however, is Emma Stone. Emma Stone is Gwen Stacy, and no one portraying the character afterward is going to be judged in a vacuum. More people saw Spider-Man 3 in the theaters than any other Spider-Man movie, but no one remembers Bryce Dallas Howard playing Gwen Stacy. Everyone who saw either Amazing Spider-Man movie remembers and will remember Emma Stone. So getting rid of Emma Stone's Gwen Stacy is huge, and went a long way into hurting the movie's already iffy standing with its audience. 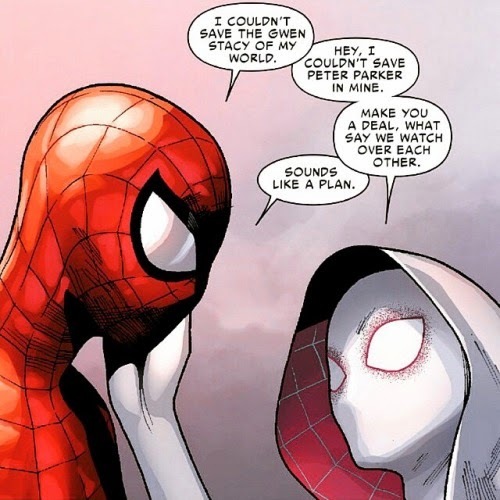 In addition to all that, the chemistry between Gwen and Peter was so palpable (as one Cube reader pointed out, if they had started doing it right then and there on screen, he'd have believed it) and their love story was the main thrust of the movie, that not giving them a happy ending pissed people off. You could make the argument, of course, that Gwen's death in the comics also caused a very vocal negative reaction. Stan Lee was yelled at during some college talks so badly, he had to ask the writers to find a way to bring Gwen back somehow, leading to the original Clone Saga, which I will not recap here. (Maybe someday.) But a movie franchise isn't the same thing as a monthly comic. and where the Death of Gwen Stacy rocked the comics world and changed everything, it didn't do the same thing for the movies. Partly it's because it was a game-changer in the comics; it was the first moment when a major, or even flagship, hero (I need that qualifier so no one can bring up Aquaman or Namor) absolutely failed the love of his life. That's not the case with the movies, when The Dark Knight already took that cue (not that Maggie was the love of his life or anything), and not when Gwen's death was the third in two movies, and Peter's second straight failure in as many movies. Yes, being the guy for whom things might fail is kind of Spidey's thing, but it's not hard to see as being a little too much. And finally, the one I think is the real reason behind it all: Gwen didn't have to die. A while back, Ben wrote that comic adaptations don't have to be incredibly strict, and that strict adaptation is too indulgent. And he's right, we don't have to stick to the canon because it's a different medium, for different audiences, and for different times. Tradition isn't really a good reason for anything if tradition is the sole reason. 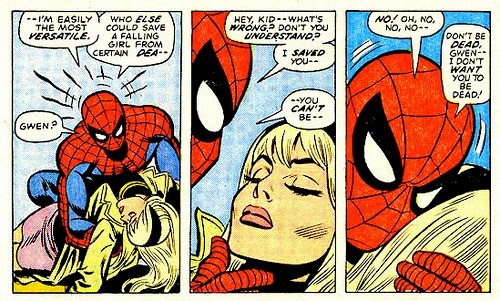 When Gwen Stacy died in the comics, that was basically the purpose of women in these superhero stories. Even the Wasp, founding member of the Avengers as she was, or the Invisible Girl, first lady of Marvel, would take a backseat to the men on their teams. But it's a different time. 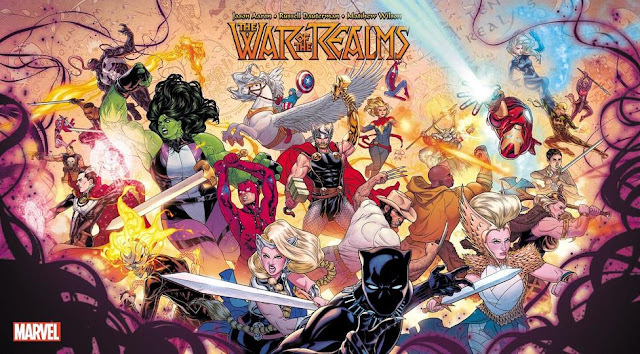 We're in a different age now, an age where a record-breaking number of women go to the theaters to see Guardians of the Galaxy, an age where both Marvel and DC Comics are producing more comics centered around female protagonists than I'm pretty sure they've ever published before, an age were people want to see women in their fiction and see the strong ones thrive and be rewarded, the same way fiction does for men. Emma Stone's Gwen Stacy was such a woman. People didn't want her to die, because they wanted her to be rewarded, to be with the one she loves, in a place where she could pursue what she wanted to do, and to see more of her moving forward. Hell, I didn't want her to die, and I knew she was probably dead the moment I saw the green trenchcoat. You don't need to look farther than the Spider-Man comics this year to see Gwen's appeal. As part of the Spider-Verse event (with its final issue out this week! 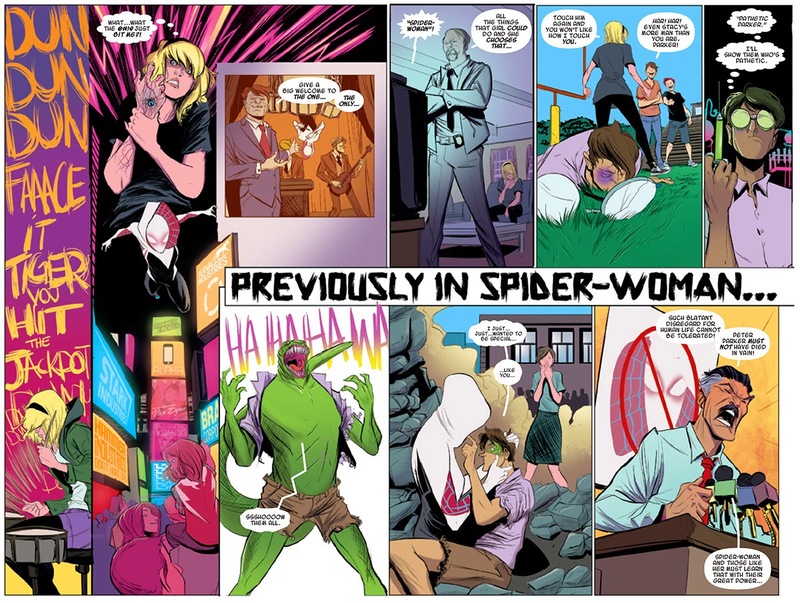 ), involving multiple dimensions full of different versions of Spider-Man, one world has Gwen Stacy as Spider-Woman. 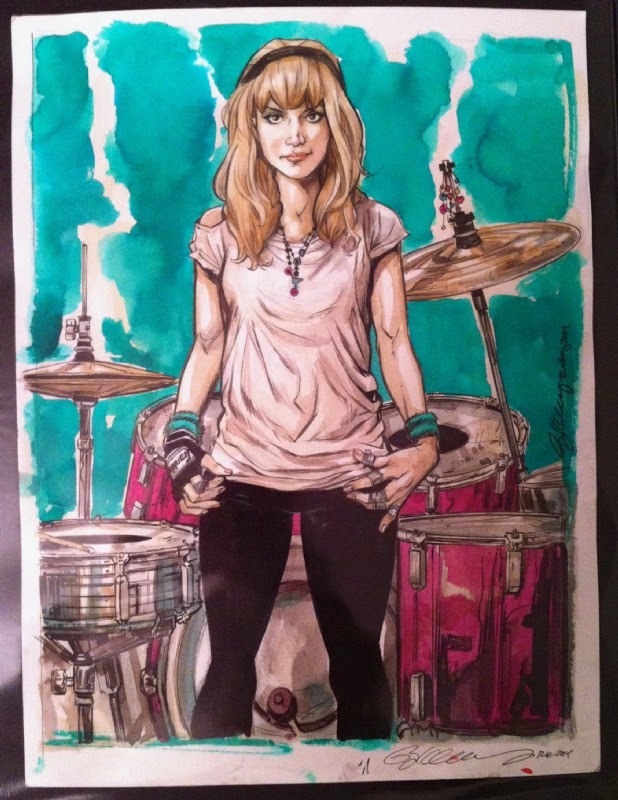 In this universe, she's a drummer for a band called The Mary Janes (making this at least the third comic band fronted by a redhead and named after that redhead, after the Archies and Josie and the Pussycats). In her first appearance, Jason Latour and Robbi Rodriguez told her backstory and origin in just a couple of pages. It was extremely well done. Making this version of Gwen just that much more poignant is that Peter Parker is dead on her world, giving her the right touch of tragedy as well as shuffling Peter out of the picture, the same way Gwen was shuffled out of Peter's world, so that the spotlight would be all on her when she finally gets her own series this month. The success of Spider-Gwen was incredible. Even before she debuted, we were already getting fan art and cosplay pics. Look, here's some of them. Her first appearance, Edge of Spider-Verse #2, sold out and went to multiple printins, and people demanded a new series with her front and center right away. When the main Spider-Verse story started, she showed up and was introduced as "your new favorite," which, if you look at social media, is appropriate. We don't have to stick to canon when there may be better alternatives. We don't have to stick to the conventional wisdom — Bucky was brought back; anything goes if you can make it work. For the longest time, Gwen Stacy was the symbol of heroes failing, of the stakes being driven higher, of characters, especially women, just by the nature of the medium back then (and even now), being taken away from the protagonists. And now, 15 years into the 21st century, she may well be the symbol of those characters taking their lives back, of taking their fates into their own hands. 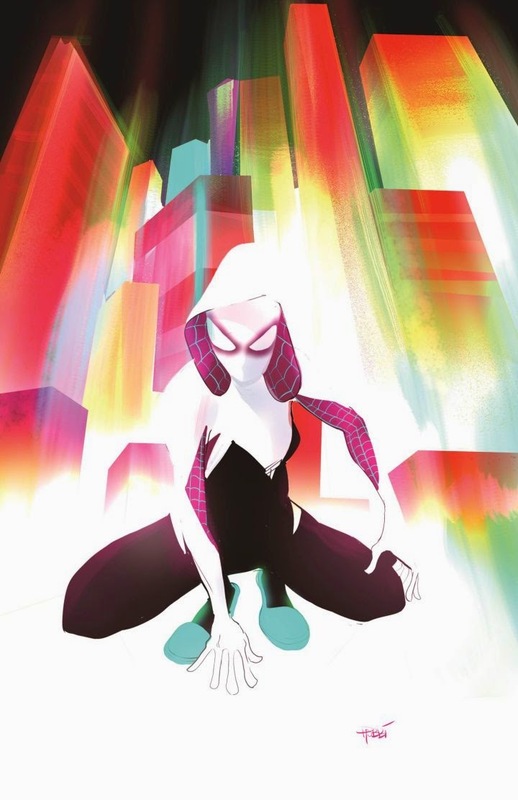 Spider-Gwen may well go down as the symbol of that era in history when, finally, it was not only accepted, but also common, for women to headline their own books and be superheroes. Gwen Stacy is dead. 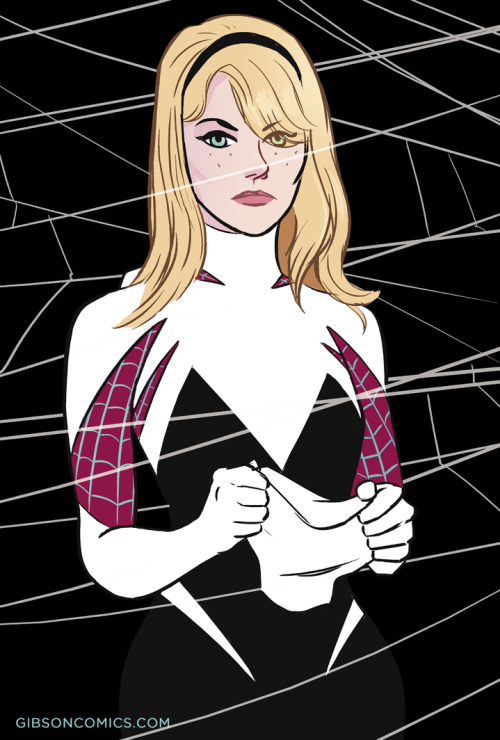 Long live Gwen Stacy, Spider-Woman! Interesting article and all, but I couldn't help but chuckle a bit at the end. I don't think Spider-Gwen is a symbol for anything. Other than the fact that branding is truly the world's greatest superpower. I say the idea that she is somehow the sign of "changed times", seems like an incredible stretch. Border-lining mental gymnastics. Wonder Woman is a long running comic, which is obviously stars a woman. Not that it matters, but the idea that Gwen has made selling title's starring women normal is almost a completely laughable concept. I mean Spider-Gwen is not for me. And I'll acknowledge that she has a nice following. But I don't see anything that makes her remarkable in the landscape of comics, let alone the current era of comics. It's a fair assessment. I did say she "may well go down" as the symbol and not making a definitive claim back then. I think she is a sign that times are changing and that you can market a fully clothed superheroine and not necessarily be expected to flop, and I still stand by the fact that Gwen Stacy was the girl who died and Spider-Gwen is the girl who took it back. But yeah, at this point I don't think she's sustained enough success to be a symbol. I don't think much of anything's changed. If you can tell a good story, people will follow it. I wish Spider-Man 2099 could've had the success she's had, but hey, that's life. 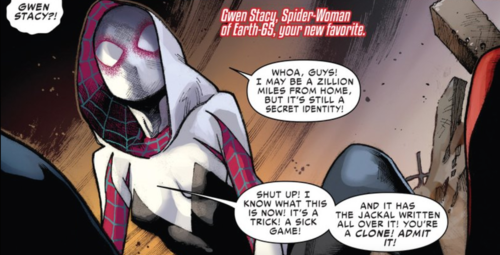 As far as Gwen being "the girl who died" and Spider-Gwen "taking it back", I suppose I'd agree I hear the name Gwen again nowadays. Also, appreciate the comment approval. Inasmuch as I'd like to believe that good stories will naturally build an audience, history has proven that's not really the case.